Monday was the feast of Blessed John Henry Newman, our Cardinal, and on Sunday night the traditional Night Walk to Littlemore took place, marking the arrival of Blessed Dominic Barberi to receive Newman into the "One Fold of the Redeemer" on 8th October 1845. We stopped and prayed on the way outside Trinity College, where Newman was an undergraduate, the University Church, where he was vicar, Oriel College, where he was a Fellow, St Alban Hall, where he was vice-Principal, the Angel Inn, where Blessed Dominic alighted the coach, two houses where Newman's mother and sister lived on Rose Hill, in Littlemore at the church and school built by Blessed John Henry, and then finally at the College, where he lived and then was received into the Church. His set up there had been contentious. It was thought that he was instituting a high church monastery and the Bishop of Oxford, Dr Bagot called him to account. He assured Dr Bagot that this was a common house, shared between clergymen and others thinking of clerical life, and there was a school master too. It was a house with a discipline: there was one joint meal, generally meat, often cold, taken at 5 in the afternoon. The day began at 6 in the morning, but at 3 during Advent. How like the life of the Oratory here in Oxford! By going to Littlemore, it is clear that John Henry Newman was embracing something new. He was not replicating collegiate life with an intense devotional twist, but rather embarking on a fervent time of prayerful reflection in good praying company. His home for four years, he was not to return for over twenty. And yet how significant Littlemore is in the story, for this was the place of his reception in to the full communion of the Catholic Church, for this reason his tenderness towards simple fixtures and furnishings. And this is our reason for a pilgrimage to Littlemore. That place where he had asked Fr Dominic to do the deed. Warmed and willing, Blessed Dominic Barberi had arrived on 8 October, and now we mark the feast of Blessed John Henry Newman at the time of that great event, the reports of which were said to have rocked Protestant England. At about the time Newman left Oxford for Littlemore subscriptions were being raised for the Martyrs’ memorial in the centre of the city. Newman’s opponents mischievously sought some contribution from our Beatus, together with others like Keble and Pusey. Pusey apparently gave reluctantly. Evangelicals, objecting to a cross, wanted a church. Eventually Gilbert Scott won a competition and the memorial, in all its ambiguity stood as a sign of no popery. The slate honours board of the University Church tells the story and the Catholics have their cost of conscience fleshed out by a very helpful pink pamphlet from Blackfriars. I have often stood near the pulpit in St Mary’s and, thinking of it as Newman’s with convert clergymen, said a prayer. On one occasion, Methodist preachers from Oklahoma were making a similar pilgrimage; although for them church and pulpit were Wesley’s. 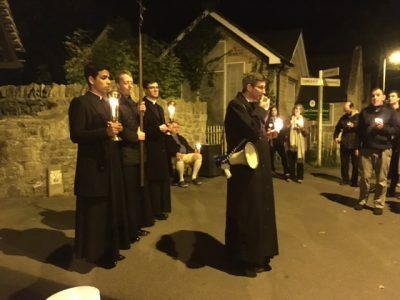 For the last three years I have been at Wolvercote, spending privileged time with that movement of the heart which inspires a minister or a religious in another Christian community, to follow what Blessed John Henry Newman did on that October night in 1845. Littlemore, that memorial, and the pulpit (or at least the site of the pulpit if not the original), have been part of the tour for our visitors. And in God’s providence Wolvercote has had its own Newman association, for although Blessed John Henry Newman would not have known the old vicarage (the base of the St Barnabas Society), he would have been a frequent visitor to the church. A series of temporary curates served St Peter’s Wolvercote until the middle of the 19th century. In 1834, on several visits, JHN was amongst that happy band. And this simple fact has delighted our converts’ aid visitors. Amidst the richness of thoughtful theological thinking, in the faithfulness to prayer and the ascetic life, in the connections and the profile, it is consistently the moment of conversion which has been the Newman point of reference for those who come our way. And whilst this is a journey (a pilgrimage and a coming home…) as they are fond of saying in parish instruction and preparation for the sacraments for adults, it is first and foremost a moment. A moment of sacramental grace in penance, confirmation, and Holy Communion through which a Christian of another confession becomes a Catholic. For some, especially those who have been clergymen, this is the stage of the journey seems an illusive, a shaky, shadowy time, put off and agonised over; but for many it is a moment which is, yes painful, but gloriously inevitable. And so there is much to kiss tenderly, as an act of farewell., of course there is, but at the heart of Blessed John Henry’s moment, which this feast marks, is the conviction of the One true fold, the fullness of faith at the heart of the Catholic Church. And the religion of memorials and special pulpits and even medieval chancels and old vicarages will no longer do for those who allow the heart of John Henry, as well as his mind, to speak.